In their new work for the 3. Berliner Herbstsalon, Wermke / Leinkauf deal with the phenomenon of organized football fans and ultras in the context of social uprisings. From the many Occupy uprisings in Spain through the Istanbul Gezi-Park revolts in the summer of 2013 to the so-called Arab Spring and on Maidan square in Kiev, football fans have played a central role in recent social movements. Out of a rather apolitical, often destructive, pool of fanatical football supporters, diverse groups emerged that supported political actions beyond football stadiums with their techniques for resistance. Wermke / Leinkauf survey the potential of active fan cultures and its fascination. Matthias Wermke and Mischa Leinkauf have been working as the artist duo Wermke/Leinkauf since 2004. 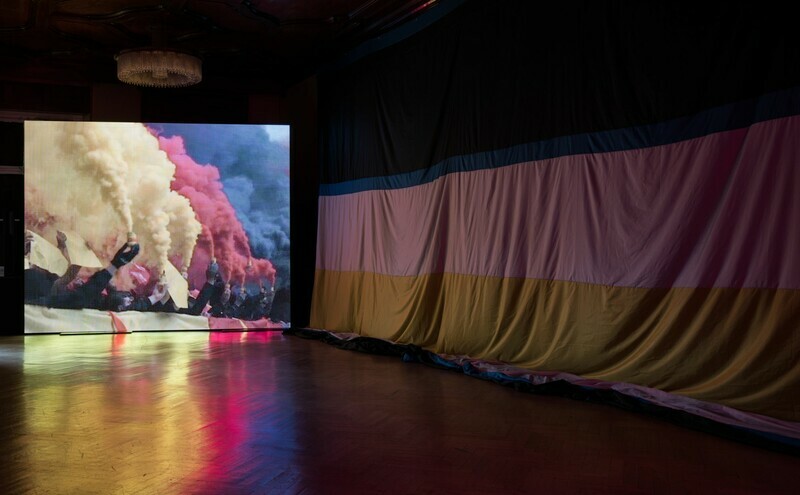 Their works have been featured at Manifesta 11 (2016) as well as the Akademie der Künste (2016), at the Museum of Contemporary Art Tokyo (2011), Kulturhuset Stockholm (2012) and the 2. Berliner Herbstsalon at Maxim Gorki Theater (2015).